There is a unique rehabilitation unit, one of five in the country, attached to the Hunter Holmes McGuire VA Hospital in Richmond, Virginia. This polytrauma unit serves all branches of the military and concentrates on treating traumatic brain injuries, or TBIs, which have become an all-too-common diagnosis for troops returning from war. Encountering explosives—often multiple blasts—during combat impairs the brain, requiring intense and specialized rehabilitation. TBIs can affect mobility, speech, balance, hearing, sleep, and mood. Some of these patients must relearn how to walk and talk and do things independently. For every veteran with a TBI, life is forever changed. The Polytrauma Rehab Center and its dedicated staff helps patients heal and transition into that new life—that of living with a brain injury. In an effort to support these disabled veterans, Freedom Alliance plans regular events with the therapists and patients of the Polytrauma center. These activities correspond with the therapy’s transitional program, providing a normal, everyday experience outside of the hospital. One of these events is an end-of-year dinner. This December, we hosted ten patients and two therapists at the Texas de Brazil Steakhouse in Richmond. None of the patients had eaten there before, and it was so much more than a meal—but rather an adventure. The Texas de Brazil churrascaria, or Brazilian steakhouse, carves meat at the tables: garlic-roasted sirloin, beef ribs, pork loin, bacon-wrapped chicken, seasoned sausage, and other cuts of meat go straight from the cutting board to the guests’ plates. Seeing the abundant portions, the patients soon began who-can-eat-the-most competitions. And although everyone insisted they couldn’t possibly eat another bite, that all changed once the dessert display came out! We can’t say enough good things about Texas de Brazil and their incredible offer to host this dinner and many others through Freedom Alliance, as we honored military service members in Denver, Buffalo, Fort Worth, Washington, D.C., and other cities in 2016. 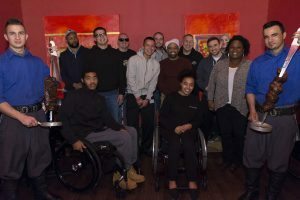 The Texas de Brazil folks have even allowed us to provide an all-terrain track chair for a Marine who lost both his legs in a fire by sponsoring the purchase. This family-owned business appreciates and supports our country’s military and has again offered to donate more troop dinners in the new year. With Texas de Brazil, we know for certain that the veterans we treat to dinner will come away with much more than full belly!